At the Olsen Law Offices here in San Diego, we always put our clients first. Attorney Chris Olsen and his team know that when a serious accident occurs, a skilled personal injury attorney is crucial. This is especially true when it comes to injuries to the spinal cord. Catastrophic injuries to the spinal cord can have tragic outcomes, and victims and their loved ones need an experienced advocate on their side. 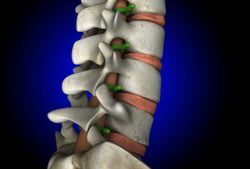 Diseases and systemic conditions can also lead to injuries or impairments of your spinal cord. Many spinal cord injuries may result in slipped/ruptured discs, fractures of the vertebrae, or injuries to the tendons, ligaments, nerves, and muscle tissue around the spinal cord. These kinds of injuries can lead to discomfort and pain or temporary loss of mobility; some of these injuries may have lasting effects on mobility and wellness. Paraplegia is a form of permanent disability that occurs when the lower portion of the spinal cord is severely injured. Paraplegia means the loss of use and sensation in the lower extremities. People who suffer from paraplegia will be bound to a wheelchair for the rest of their lives and experience significant hardships in day-to-day life. Also known as tetraplegia, quadriplegia is a more serious form of permanent disability. This refers to the loss of sensation and use of all of the limbs and often much of the rest of a person's body below the neck. This occurs when the upper portion of spine in the cervical region (neck area) is damaged. In severe cases of quadriplegia, a ventilator may be required to assist the accident victim with breathing. Those who have suffered from paraplegia or quadriplegia as a result of an accident will experience major changes in their overall quality of life. They will need to change their careers given their sudden physical limitations and will often require assistance from loved ones to do simple, everyday tasks. It's also common for those who are injured to experience depression as a result of their injuries and significant impact on their quality of life. Even those who are not paralyzed as a result of a spinal cord injury may face long-term effects on their wellness and mobility. For some patients who have experienced lower back injuries or injuries to the cervical portion of the spine, there may be certain actions that they can no longer perform, they may be restricted from performing their usual job duties, and their general ability to get around may be impaired in some fashion. A personal injury attorney will fight for you and your loved ones each step of the way, making sure that you receive just compensation to cover medical bills as well as any other hardships that may be experienced. For paraplegic and quadriplegic clients, an attorney will be especially dutiful about collecting damages to cover the cost of long-term medical attention and the cost of any other equipment or devices necessary to ensure a decent quality of life. For more information about spinal cord injury lawsuits and how our legal team can help victims in their time of legal need, it's important that you contact our personal injury law firm today. At the Olsen Law Offices, we fight diligently to ensure that just compensation is obtained.